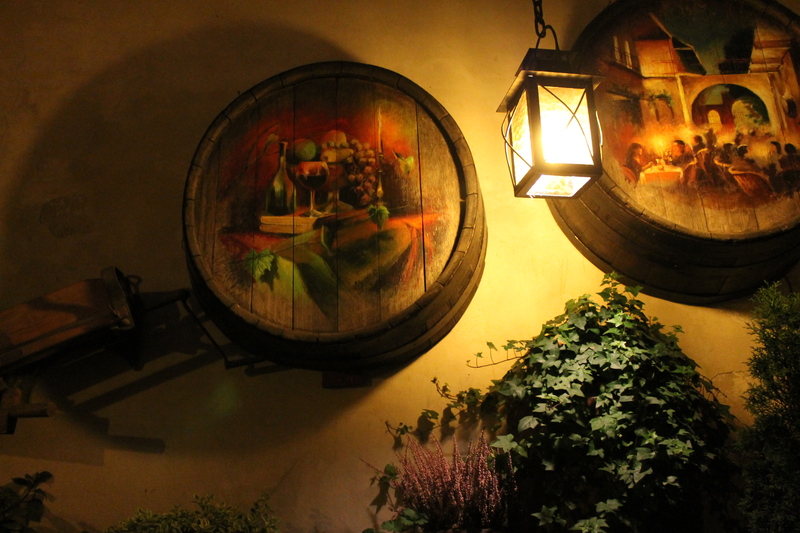 Kraków, November 2014 – Tasting the World – On the road, with stuffed hand luggage and face. Camera in my hand. 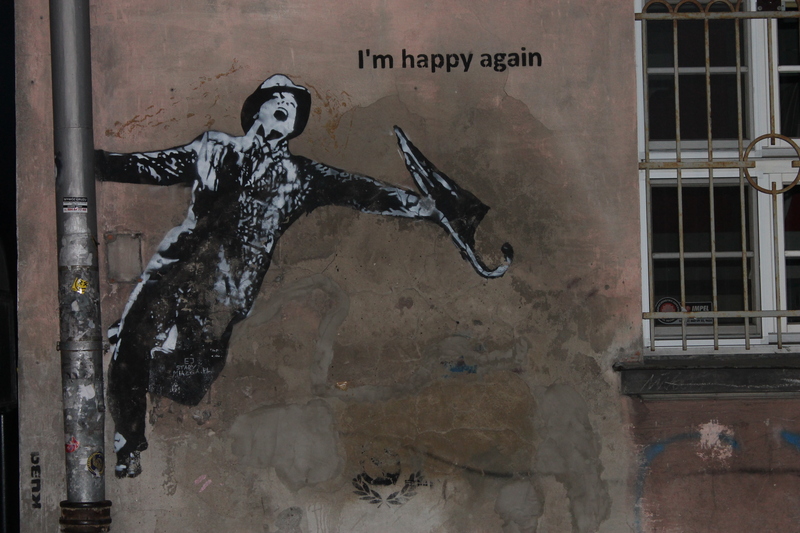 In the middle of November we went to Kraków. It was again one of our favourite weekend breaks with departure on Friday and arrival on Sunday. After a more than three-hour flight we landed and when we finally made our way out of the airport in Kraków, we found out that the bus to the city centre left just minutes ago, the next one coming in an hour. Fortunately we were not alone – some guy and a girl were reading a schedule on a bus stop wall. As we found out later, they were two Americans on a scholarship in Germany, travelling around Europe. They didn´t really want to wait for an hour either and their accommodation was just a stone´s throw from ours, so we agreed to take a taxi together. The journey was quick, partly because we talked about how and where who travels, partly because the driver rushed as if he had just kidnapped us. However, we arrived safe and sound, checked in and hit the town. Naturally we headed to the centre to the main square. First we passed a bastion and soon we were on the Florianska street. 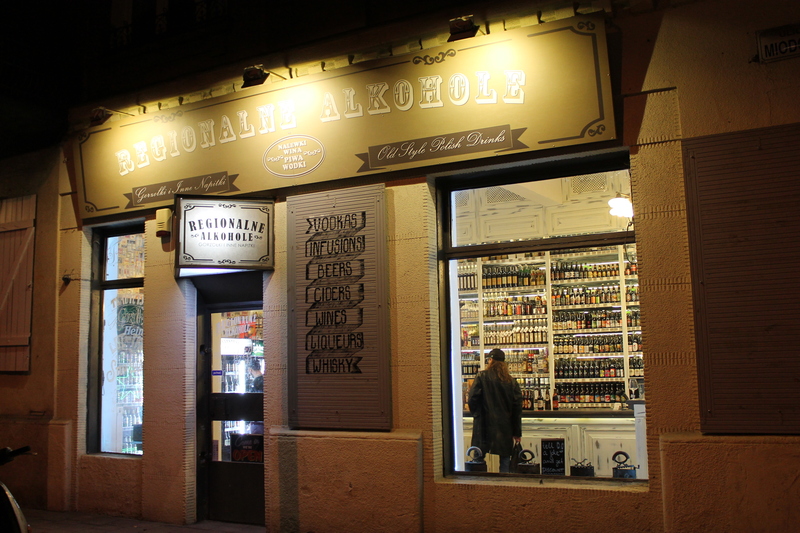 There we spotted a shop called Staropolskie trunki (Traditional Polish Drinks) that invited people for tasting. We tried some flavoured as well as unflavoured types of vodka. The good thing was that it was for free and the two friendly girls behind the “bar” didn´t even force us to buy anything. Then we went to see the main square. It was quite busy there, well, Friday night in town. I liked Kraków straight away. 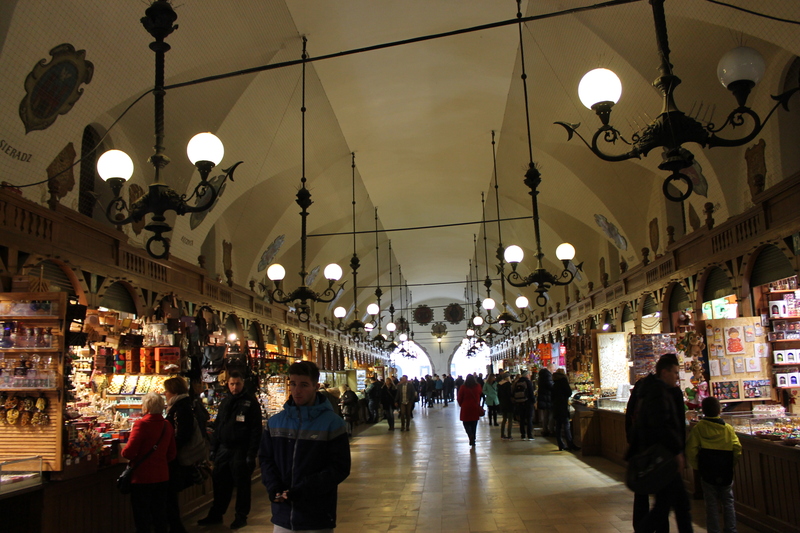 Many places looked like in Prague – similar architecture, atmosphere, people, prices – so I felt like home. On Saturday we went sightseeing. We passed the bastion and – hmm, the Florianska street looked so different in daylight! The church towers on the main square (Rynek Glówny) were still in fog, two men standing next to the Florian´s gate were playing a trumpet and an accordion, there was a whole gallery of some painter´s pieces hung on an old defence wall… Simply a leisurely autumn morning. We went to see the St. Mary´s church on the main square. 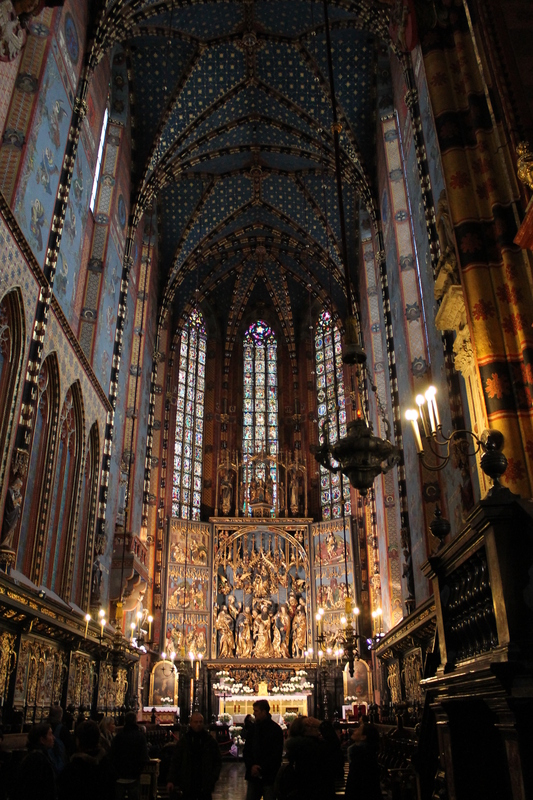 Although you could expect that in Poland there´re gonna be nice and well-maintained churches, I was still quite surprised. Lots of colours and ornaments, sometimes it felt like I was in a palace. Then we went to see the Sukenice building in the middle of the main square. We found out that it´s actually an arcade with souvenir shops. We bought a small music box playing the Pink Panther melody and got a voucher for 1 + 1 beer for free. Actually several vouchers. According to the shop assistant´s instructions we found the place and it turned out that it is no barrelhouse, but a nice restaurant. We walked around the main square for a bit longer, meanwhile I realized that I´m cold and so we went to try out the vouchers. I had a cup of tea to warm myself up and a delicious apple strudel with a scoop of ice-cream, my boyfriend had grilled cheese. They also brought us pickled gherkins with cabbage. Polish tapas. Besides, we tried lemon vodka. Everything was tasty! 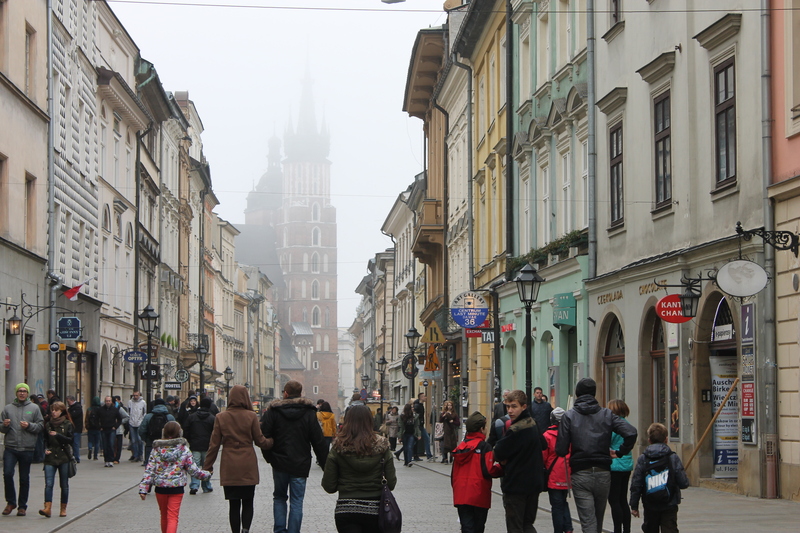 Refreshed, we could continue in our stroll in foggy Kraków. 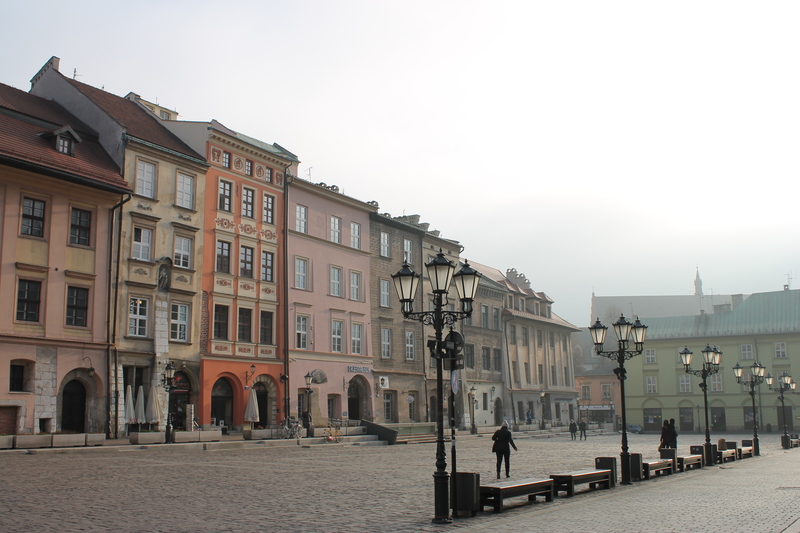 We found out that a nearby small square (Maly Rynek) may be even prettier than the main one. 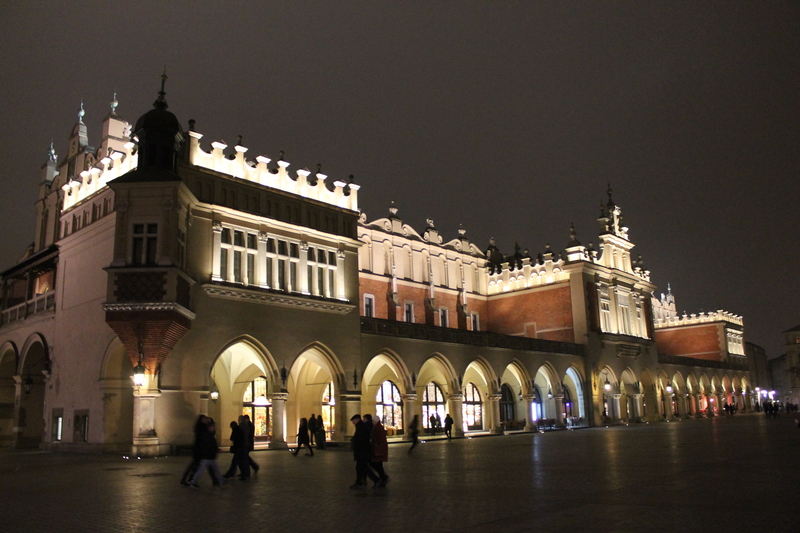 Then we continued according to our map to see some churches and slowly we were coming to Wawel, the castle of Kraków. The whole castle complex is very well preserved. Unfortunately, for Saturday they didn´t have any more tickets for the castle interiors viewing, so we went to see at least the crypt, the bell towel and the cathedral. 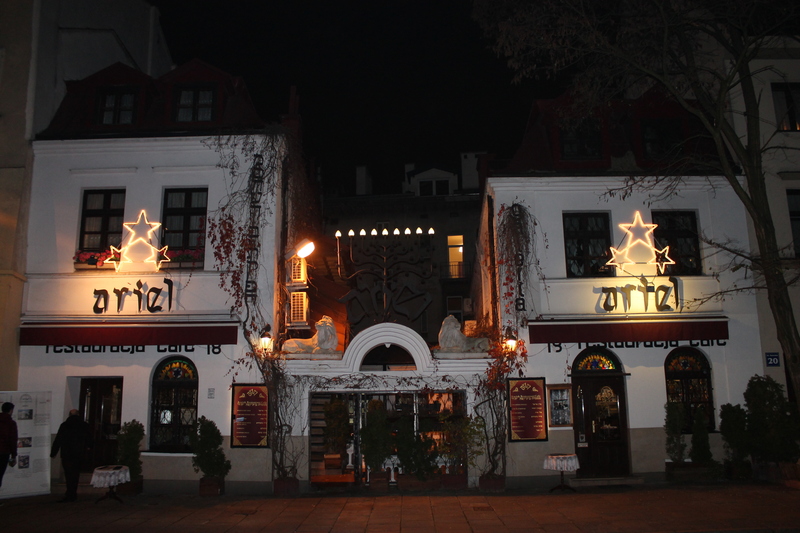 We left the castle and continued to Kazimierz, originally a Jewish quarter. Straight at its beginning we went to a nice looking restaurant. We had pierogi filled with meat and cheese and topped with fried onion. I was pleasantly surprised that they had Pilsner Urquell on tap. After the late lunch we went to explore Kazimierz. All the streets were full of bars and restaurants. One of the things I like about Kraków is that there are countless small original businesses, each in a specific style. 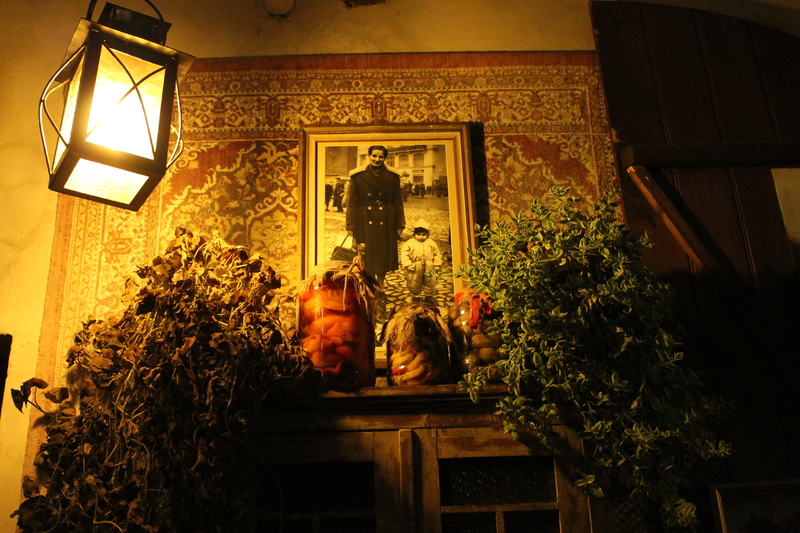 A restaurant with a yard like my grandma´s, a beer museum with a room equipped as a chateau chamber, a café in natural style, etc. Not so many uniform chain places. On Sunday we hurried to the castle straight in the morning so that we get tickets. The good news was that the tickets are for free in November. The bad news was that we had to queue a lot. However, we got them and I think it was worth it. The castle reminded me again of Czech castles and chateaus with plenty of furniture, historical items and stories. When the castle viewing was over, we went down to the town, walked around its another part aroud the university and finally ended up in our favourite restaurant for a tartare steak and some Hungarian dish. And then… then it was high time to go to pick up our luggage and go to the airport.